There are those among us who refuse to allow what some design team deemed as the pinnacle of design for a particular model of car. Instead these brave souls forge ahead and reimagine said design to suit their own needs, whether it’s to house a bigger engine, wider wheels, lower ride height, or the combination of all three that sees a cutting disc put to steel. 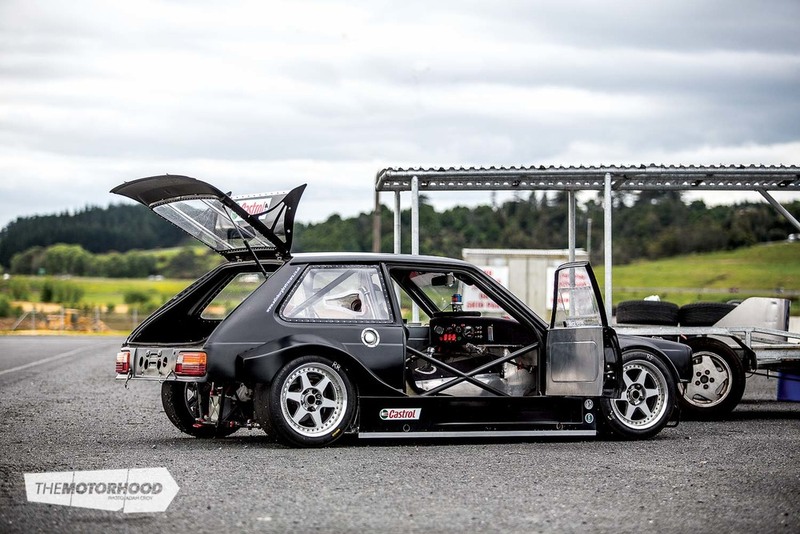 For Peter Schey, a man with a near lifelong love for the humble Toyota Starlet, it was ride height and other limitations associated with keeping a car road legal that saw him head down a path of discovery and creation in his garage at home. The result shown in these pages still resembles the Starlet Peter purchased 14 years ago, but look beyond the matte black panels and a world of amazement awaits. 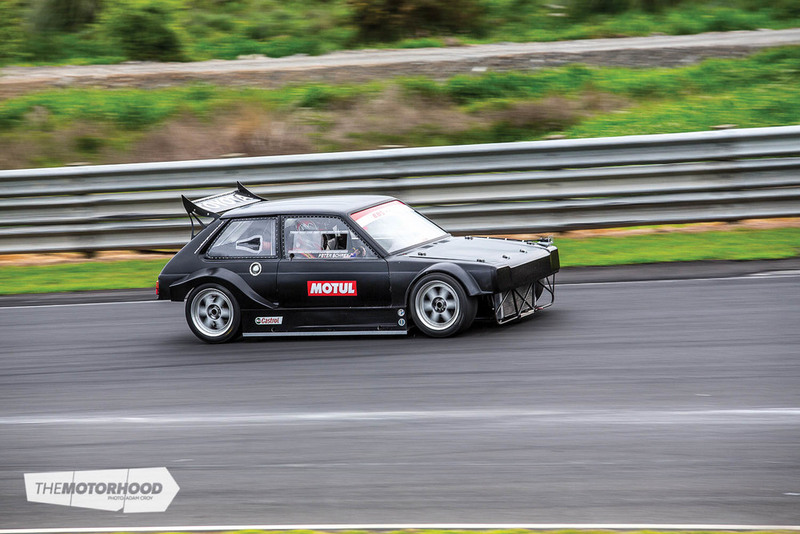 It began, like many before it, as a road-going project which would see regular track work: Peter was running a turbo 4AGZE and a basic six-point roll cage at the time. 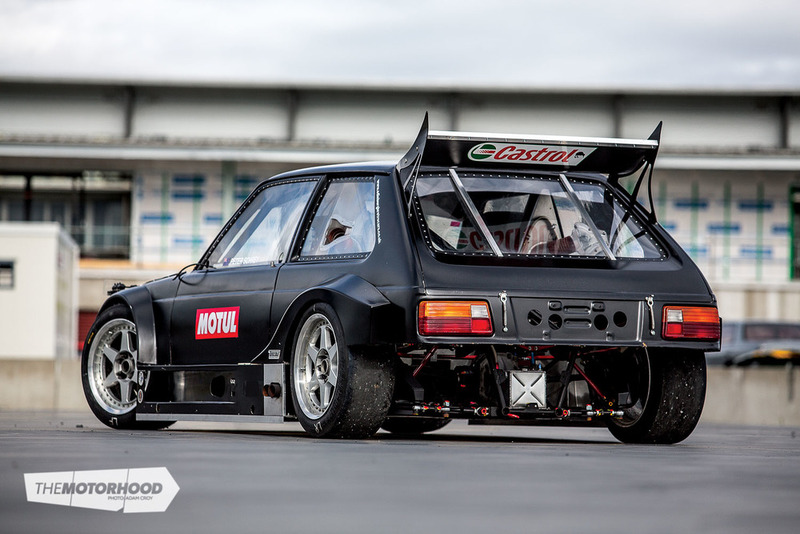 But after a few years, the lack of all those good race-car things that are frowned upon in street use spurred his decision to dive into the deep end, tube frame the chassis, leave behind the limitations associated with the factory unibody, and take the Starlet off the road for good. You see Peter’s day job is as a fabricator/engineer at Fraser Cars, which goes someway to explaining the blank canvas approach applied to the build. 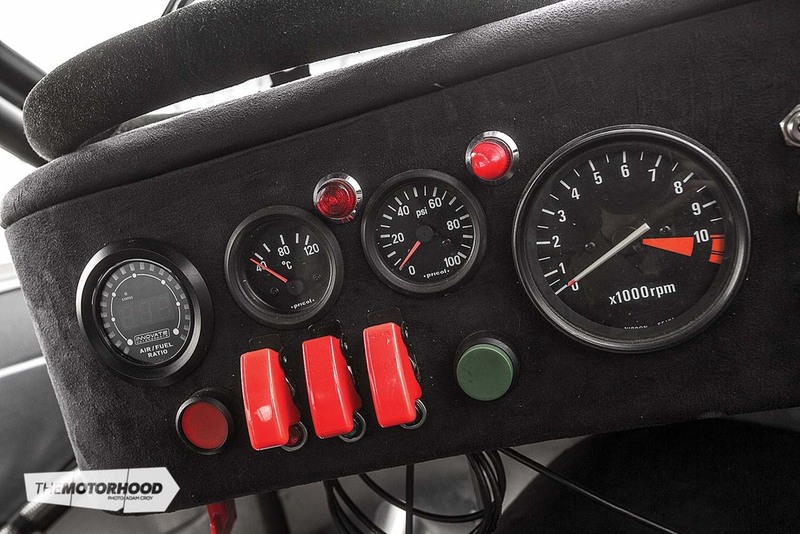 Although his job does mean his knowledge and skill base is more advanced than most, the long-term project has served as a learning tool as much as a means to acquire a race car. The learning curve began right from day one, with designing the new chassis. “I did a lot of research through books that I was reading at the time. I had a lot of the measurements and the confines of the chassis with me on paper, and when my wife and I went to Tonga for a 10-day holiday, I was planning things out, how it was all going to work, and designed the chassis.” Peter explained. 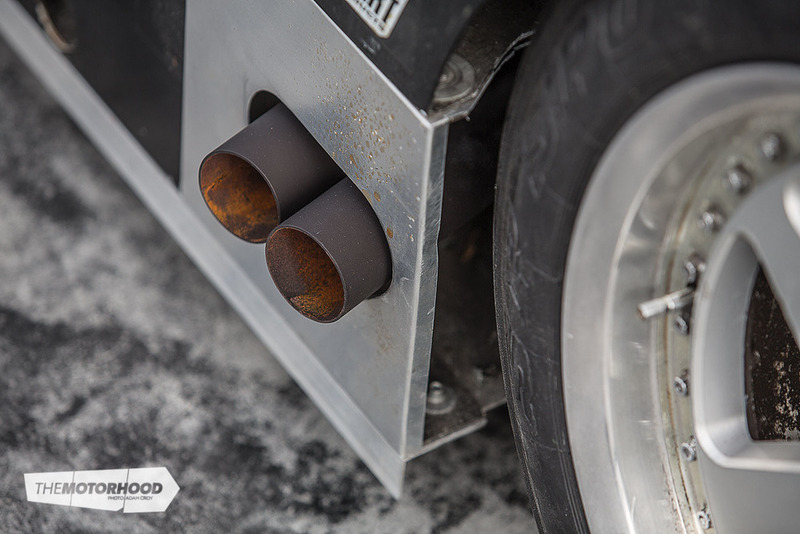 The basis for the tube chassis was designed around the existing basic six-point cage that Peter had Herbert Fabrication install years earlier, before he was a fabricator. The first cuts saw the floor pan removed, and then the car was welded to a chassis table. The new tube frame was constructed in sections, beginning with the front, then the centre section, followed by the rear. Once the frame was built, it was onto building the adjustable double A arms, and other suspension components including the uprights. Very little is left of the original body shell. Even the roof, A, B and C pillars had any excess metal removed, either it was unstitched altogether, or a hole was sawed if some extra strength was needed. Estimates put the body around the 60–70kg mark. This weight-saving dedication has been carried on to the other body panels, all of which were designed and constructed by Pete. He built up and shaped MDF plugs, which were then painted and polished before fibreglass panels could be lifted from them, as Peter elaborated. “Most of the panels are all about one to 1.2kg. I lay them up with only two layers of 300gram chop strain. Then once removed from the mould, I press on the panel to find the spots where it’s flimsy. Anywhere the air speed will hit it and cause it to deform, I strengthen. If there is a corner or shape, a couple of layers is usually enough, as I really hate heavy fibreglass components.” With the large side pods, quarter-cut doors, the shape of the widebody and chopper rear bar, it’s easy to see the influence of Zakspeed, European hill climb, DTM and other ’80s and early ’90s touring cars coming through in its design. There is still a front bar to complete the look, but that remains a work in progress. It’s the geometry that he is forever attempting to refine, the uprights have been changed at least four times so far, and as you read this, they will go back under the knife, this time to reduce the scrub radius, which Pete hopes will also reduce the amount of kickback through the steering. It’s all part of the trial and error, an ongoing real-world education with the Starlet serving as the test mule. The current block has been in the car since it was tube framed, although with varying set-ups, and it even spent a few years turbocharged, but Pete found that combination a little hard to drive on the limit, and decided to swap back. “In turbo form it ran 7psi and 11.5:1 compression, that was a cool set-up, making around 300hp [224kW] at the wheels. But with the turbo as a circuit car it was a bit twitchy in terms of the power, and because the car was so light, when you were hanging it out on the corners it wasn’t as linear as the NA, which is much easier to drive on the limit, as you know where the power is. You can really hold it at 9/10 through a curve now.” When switching back, on went a version-five head, but not before a quick 0.3mm plane to bump compression. Pete also flowed and polished the ports. And yip, you guessed it, he built the four-into-one headers and the custom tuned-length carbon trumpets, too. So where to from here? Peter plans to develop the car for a few more seasons, as he believes there are still plenty of refinements left in it. But the end goal would be to compete in something like GTRNZ. We get the feeling that long into his old age Pete will still be tweaking the Starlet. It just seems like one of those projects, and Pete certainly seems like the kind of owner who can never say yip, I’m done, and leave well enough alone. But then again, that’s part of the charm of building something with your own hands. You’re forever learning how to do something better, and if you’re not afraid to continually chop it up, like Pete, then that project will keep you busy for a very long time to come.